New findings explain synchronous deglaciation that occurred 17,700 Years Ago. 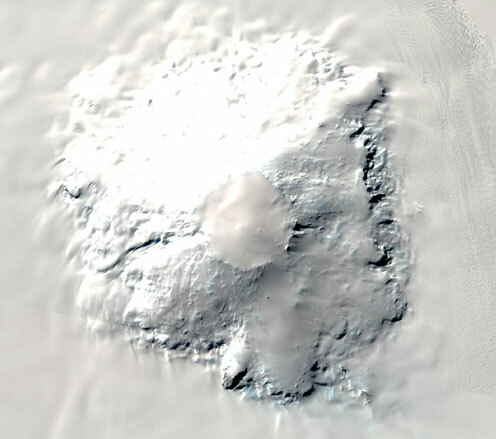 A 15-meter pan-sharpened Landsat 8 image of the Mount Takahe volcano rising more than 2,000 meters (1.2 miles) above the surrounding West Antarctic ice sheet in Marie Byrd Land, West Antarctica. “These massive, halogen-rich eruptions from Mt. Takahe in West Antarctica coincided exactly with the onset of the most rapid, widespread climate change in the Southern Hemisphere during the end of the last ice age and the start of increasing global greenhouse gas concentrations,” according to McConnell, who leads DRI’s ultra-trace chemical ice core analytical laboratory. 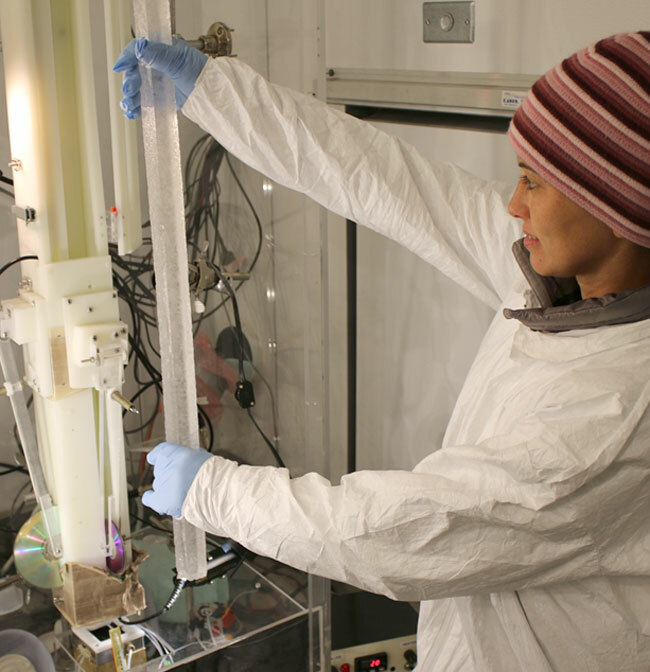 Monica Arienzo, Ph.D., an assistant research professor of hydrology at DRI, loads an 18,000-year-old sample of the WAIS Divide ice core for continuous chemical analysis using DRI’s ultra-trace ice core analytical system in Reno, Nevada. “These precise, high-resolution records illustrate that the chemical anomaly observed in the WAIS Divide ice core was the result of a series of eruptions of Mt. 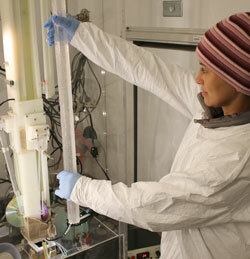 Takahe,” explained Monica Arienzo, Ph.D., an assistant research professor of hydrology at DRI who runs the mass spectrometers that enable measurement of these elements to as low as parts per quadrillion (the equivalent of 1 gram in 1,000,000,000,000,000 grams). DRI’s initial findings were confirmed by analysis of a replicate sample from WAIS Divide, producing nearly identical results. “We also found the chemical anomaly in ice from two other Antarctic ice cores including archived samples from the Byrd Core available from the University of Copenhagen and ice from Taylor Glacier in the Antarctic Dry Valleys,” said Nathan Chellman, a graduate student working in the McConnell’s laboratory. The WAIS Divide record produced by DRI and collaborators includes continuous measurements of a broad range of chemical species. These very high depth resolution data clearly show that the anomaly was the result of a series of massive eruptions of the Mt. Takahe volcano. Additional measurements and modeling studies critical to support the authors’ findings were made by collaborating institutions around the U.S. and world.